Rich, fertile Willamette Valley topsoil. Abundant rainfall. An ideal nursery climate, with winter dormancy and a long growing season. Oregon nurseries benefit from all of these natural advantages, but there’s more. There’s people. People and businesses who grow the wonderful plants. We’d like you to meet a few of them. Surface Nursery: Founded in 1925, Surface Nursery has outlasted the Great Depression, the Second World War, the Cold War and the start of the Computer Age. 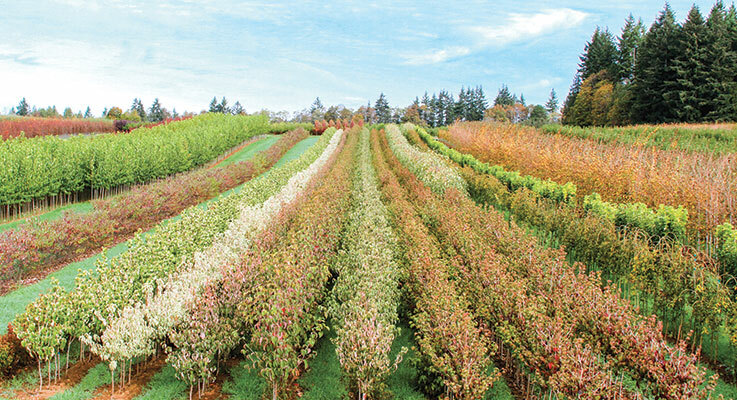 Schiedel Nursery: Mike and Lori Hanson are proud, third-generation growers of conifers, broadleaf evergreens and deciduous trees and shrubs in Aurora, Oregon. Brooks Tree Farm: Dave and Kathy LeCompte have found a niche in growing seedlings for Christmas tree farms and timber operations, and native plants for restoration and remediation projects. Tree Frog Nursery: In 1994, an ambitious college student named Carson Lord started his nursery. Today, the OAN past president ships container and B&B material to 20 U.S. states and Canada.